Social media and news agencies alike have been abuzz recently with the Westminster attack where a so-called ‘Muslim’ man injured and killed dozens of innocents in London. Once again, it becomes important to reiterate that Islam condemns such barbaric acts. Islamic teachings emphasize compassion, justice and respect for all faiths. Thus, intolerance and hate has no place in Islam. The distortion of Islamic teachings by extremists to justify such violence must be denounced. 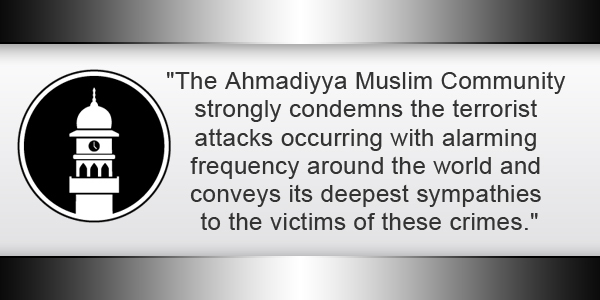 The Ahmadiyya Muslim Community strongly condemns the terrorist attacks occurring with alarming frequency around the world and conveys its deepest sympathies to the victims of these crimes. The rise of this extremism worldwide is pulling people apart, creating further divisions and mistrust. Under the leadership of His Holiness, Hadhrat Mirza Masroor Ahmad, the Ahmadiyya Muslim Community worldwide has been fervently engaged in the promotion of peace and justice. On the 25th of March, the Community in the UK held its annual Peace Symposium. The event promotes a deeper understanding of Islam and other faiths and seeks to inspire a concerted effort for lasting peace. More than 800 guests from across the world attended the unique event including Secretaries of State, parliamentarians, diplomats, faith and civic leaders as well as representatives from numerous charities and faith communities. The event included messages from Prime Minister Theresa May and the Vatican. The full video of the event can be viewed on Youtube here. As we launch this campaign locally, more information can be obtained our Facebook page AMC.Bermuda and by following us on Twitter AMC_Bermuda. One can also endorse these points at TrueIslam.com or by using #TrueIslamBermuda. 10 Mar: Column: It Will Never Lose Its Value? 17 Feb: Column: Why Did You Get Involved In Politics? You can condemn terrorism all you like but where the rubber hits the road is when you turn in your own for atrocities carried out. Up untill now this is nothing but lip service. Action is needed from you, not talk!